The KÜHL Stir™ Shirt is constructed of 100% Wildfibre™ Organic Cotton for highly breathable and super absorbent comfort next to your skin. Wildfibre Organic Cotton is among the finest available cotton KÜHL can source and a comparable fabric is not readily found on the market. 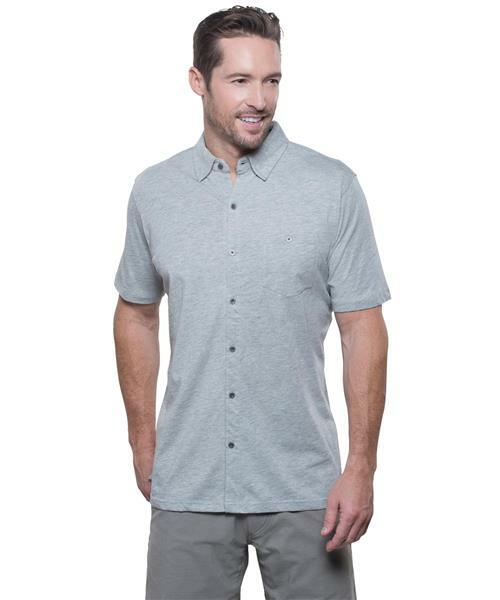 The Stir Shirt features a mélange two-tone fabric, hidden button-down collar system, and three sewn grommets under each underarm. An envelope-style security pocket inside the left hem provides peace of mind while traveling. A chest pocket and KÜHL's signature metal buttons add stylish detail. *Please note: style is slim fitting; please size up if you are in between sizes.